Relax and unwind in this 2-bedroom, 2-bathroom home located mid-island! 321 Lazy Way will capture your attention as soon as you walk through the front door from the spacious layout to the amenities included! This Florida stilt home has a fully-equipped kitchen that includes everything needed for an extended stay or a short getaway! It features stainless steel appliances, a Keurig coffee maker, a separate dining room, and an abundance of natural light! Accommodating up to 8 guests, this slice of paradise has a king size bed in the master bedroom, a double bed and two twin beds in the guest bedroom, and a queen sleeper sofa in the living room! This charming home offers its guests a second-floor deck, a Florida room, a heated private pool, screened-in lanai, and laundry room on the ground floor, along with a private driveway for parking two vehicles and a large yard! 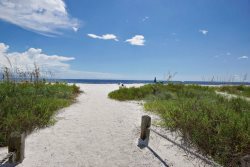 Just across Estero Boulevard, you will find the 7-mile stretch of sugar-sand beach! With a quick trolley ride up to the north side of the island, you will be sure to enjoy lively downtown Times Square, the famous pier, as well as many local shops, restaurants, and island activities! To the south, you will find a grocery store, a recreation center with waterslide, and pristine Lover's Key State Park which offers walking and biking trails as well as canoe and kayak rentals! Numerous boating options are also provided by nearby Fishtail Marina!